Having been in the patchwork industry for a long time now I see and hear so many quilters say how much they love making the quilt tops but they don’t enjoy the machine quilting part. Many of you have several quilt tops sitting in the cupboard waiting to be quilted. The main reason they are not quilted is often caused by lack of space in the throat of the sewing machine – which means you are struggling to roll up a quilt to fit in a small hole to machine quilt neatly and therefore you are not enjoying the quilting process. This can be solved in a few ways, option one is to send your quilt off to be professionally quilted – we all know these ladies do an amazing job with the machine quilting. Second option is to purchase a sewing machine with a wide throat that will enable you to fit your quilt through much easier. I love the Brother VQ2400, VQ3000,VM5100, VM6200 and the XV8550D machines for this as they also have built in wide stitches that can be used to quilt borders without turning your quilt. Option three is to purchase your own quilting ‘frame’ and this is what I would like to talk to you about today. Recently we put a ‘Grace Quilting Machine’ with a ‘Grace Quilting Frame’ on the shop floor. To say I am totally in love is an understatement – this has changed my quilting life!! Many of you know that I am in love with Vinnie – my VQ3000 and there is nothing that machine doesn’t do to make my life happy. But now that I am playing with Vinnie’s big brother it has opened up a different avenue for me. I still love Vinnie but Gerard offers me something a little different. Firstly you need to understand why we have called the new machine Gerard. I name my cars and sewing machines all the time – adds a personal touch and makes them work better! And so one morning I saw Gerard Butler on Facebook, the comment was “I would love to get my hands on that”. And later that morning we received an email saying our new Grace machine was on it’s way. I said “I can’t wait to get my hands on that” and so Gerard was named! Useless information for you all I know but it made me laugh. So back to the Grace product. There are a few options with the Grace Quilting Frame. Option One – you can purchase just the frame. This is just 3 x 5 feet in size which means it doesn’t take up a whole of room in your house. When you purchase the ‘frame’ only it comes with a ‘tray’ for you to place your domestic sewing machine onto. This is only suitable for sewing machines with a wide throat but is not limited to just Brother Sewing Machines. Once your machine is in place you have handles to hold and the tray moves your machine around to enable you to quilt. Your quilt is secured to the frame to hold it firmly in place and this is what makes it so much easier than feeding through your sewing machine on a table. It takes all of the pressure off your shoulders and arms. You have a wide space for quilting with stencils and there is no strain on your upper body, making it a much more enjoyable process. This is great for stipple work/free motion quilting. Note: Even though the frame is 5 feet wide you can still quilt up to a queensize quilt size. Remember this is not only for Brother Sewing Machines but caters for other brands that have a wide throat. Option Two – once your frame and domestic sewing machine is in place on the frame you can purchase a stitch regulator (only available for certain machines so you need to check with us). This will then regulate the stitch length that you sew to make neat even stitches. This creates perfect stitches for free motion quilting/stencil work etc – all using your own sewing machine. Option Three – if you would prefer to have a quilting machine set up all the time that can give you a wider quilting space, ease of use and will enable you to use your domestic machine on your table without moving it, then this is the way to go. 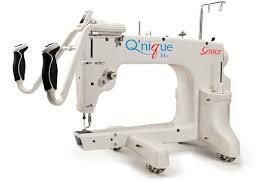 Purchasing the Grace Q’nique Quilting Machine will give you twice the quilting space, it is super easy to use. You are able to change the stitch length and quilting style by using the hand controls. But wait there is more… if you are really keen to make a big difference in your life you can also purchase software to add to this machine that has built in designs. But let’s start with the basics. Also available is a laser to follow pantographs and a table for using rulers (such as Westalee). Gerard is gorgeous, super easy to use and life changing. John had his two children quilting a few weeks back and they picked it up in a matter of minutes. We invite you to come in store and have a play with Gerard to see how easy this is to use.